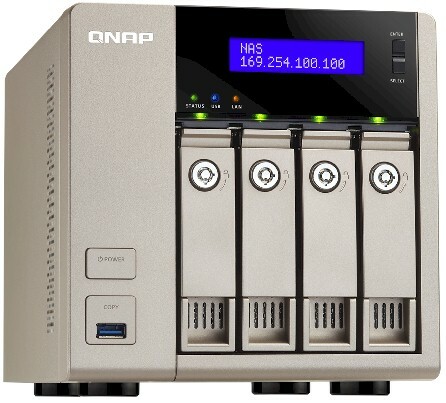 QNAP has traditionally stuck with Intel and Marvell to power their NASes. The company's new "Golden Cloud" line, however, turns to quad-core G-series AMD processors to try to bring something new to the table. The table below shows four, six and eight-bay models with 8 and 16 GB RAM options on the TVS-863+ model and 4 and 8 GB SKUs on the other three models. Note the 863+ also has a 10GbE port as standard, while it is optional on the other models. All of the TVS series support the accessories shown below, which include USB 3.0 connected expansion cabinets, RAM and various LAN port options. QNAP has opted to use USB 3.0 exclusively for external storage and peripheral connection. Other unique features are two HDMI ports and a "Console Port" that looks like an audio out jack. Removing the outer case reveals two easily assessible SoDIMM slots, one of which is filled with an 8 GB module on the review sample QNAP sent. The built-in power supply isn't too hard to remove, but getting the main board out requires removing the rear panel and some tricky wiggling to get the mainboard free of the drive backplane. I didn't take the board out since I didn't want to wrestle with the heatpipe coupled to a hefty spreader plate bolted to the CPU. I was able to identify most components, summarized in Table 1, without removing the board anyway. I used four WD Re 3 TB (WD3000FYYZ) drives loaned by WD for testing, which brought total power consumption to relatively toasty 63 W with the drives spun up and 30 W with then spun down. I rated noise level as medium low, mainly due to clunks from the relatively noisy Re drives. The case fan spun quietly for most testing, although it ramped up to high during the ~ 8 hour RAID 10 format / resync cycle due to high drive 3 temperature. The fan ran on high for five minutes at most and ramped back down after it brought the drive temp back to normal.